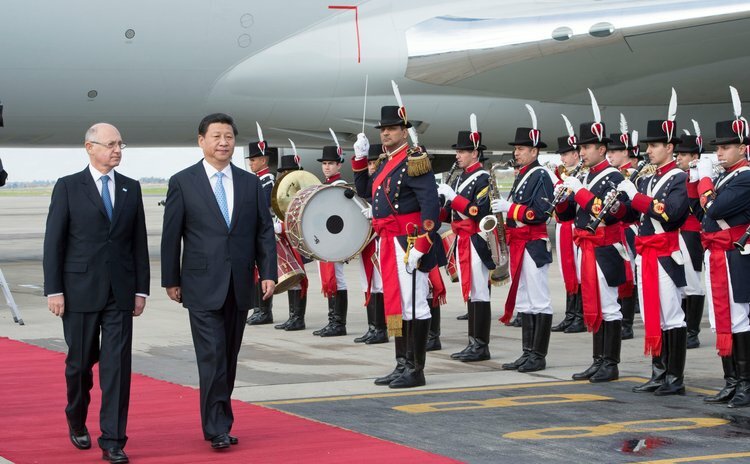 BUENOS AIRES, July 18 (Xinhua/Sun) -- Chinese President Xi Jinping arrived here on Friday for a state visit to Argentina, the second leg of his four-nation Latin America tour. Xi is scheduled to hold talks with Argentine President Cristina Fernandez and other leaders during the visit. Upon his arrival in Buenos Aires, Xi said the China-Argentina strategic partnership, which greets its 10th anniversary this year, has stood the test of constant changes in the international landscape and is at a historic moment from which it will move to a new era based on past achievements. The president said he looks forward to having extensive exchanges of views with Argentine leaders and people from various circles in a bid to further advance bilateral relations for better development of both countries. "Meanwhile, I hope to demonstrate the resolve of developing countries to strengthen solidarity and cooperation, and also boost the confidence in the development prospects of emerging markets," he said. Since the two countries forged diplomatic ties in 1972, the relations have moved forward rapidly. In 2013, two-way trade between China and Argentina reached 14.8 billion U.S. dollars, more than 2,400 times of the amount in the early days of the diplomatic ties, according to China's official statistics. China has become Argentina's second largest trading partner and a major source of investment. Argentina has become China's fifth largest trading partner in Latin America. The two sides have had productive cooperation in energy, resources, agriculture, infrastructure development, finance and other areas. Before Argentina, Xi has visited Brazil, where he paid a state visit to the country, attended the sixth BRICS summit and met leaders of Latin American and Caribbean nations. His Latin America tour will also take him to Venezuela and Cuba.